BELGIUM: Siemens Gamesa's roll-on/roll-off concept, first announced in November 2015, has been fully implemented for the first time, the manufacturer has announced. 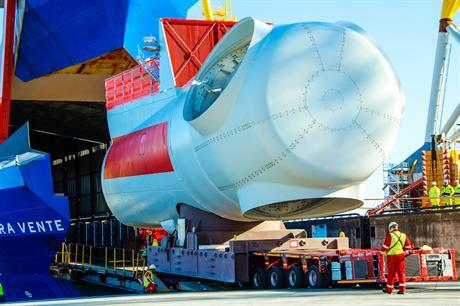 The company delivered the first load of nacelles from its factory in Cuxhaven, north Germany to the 309MW Rentel project off the coast of Belgium, without the need for cranes, it stated. It can roll 200-tonne tower sections and 400-tonne nacelles on and off its purpose-built transport vessels, the Rotra Vente, using self-lifting, motorised transport structures during delivery, the company claims. Siemens Gamesa believes the process can cut logistics costs by about 20% using the roll-on/roll-off process. Andreas Nauen, CEO of offshore wind at Siemens Gamesa, said: "As our manufacturing footprint and logistics concepts continue to mature, we make additional progress on lowering the levelised cost of energy (LCOE) for offshore wind." Siemens Gamesa will deliver all 42 units of its SWT-7.0-154 model for developer Otary’s Rentel project over the coming weeks, it said. The turbines will be preassembled and installed together with the towers and nacelles from the recently opened installation facility in the Belgian harbour of Ostend. Rentel is due to be operational by the end of the year.